Lush Fab Glam Inspired Lifestyle For The Modern Woman: Have You Tried 'TRESemme Fresh Start Dry Shampoo'? Plus Win a $500 Gift Card! Have You Tried 'TRESemme Fresh Start Dry Shampoo'? Plus Win a $500 Gift Card! Bad hair days are a thing of the past thanks to TRESemmé Fresh Start Dry Shampoo. You no longer have to worry about having enough time to wet, shampoo and blow dry your hair to get that clean, lustrous look and you won't need any water either. TRESemme Fresh Start Dry Shampoo's unique formula will absorb excess oil from your hair and leave it smelling citrus fresh and rejuvenated. 1. Strengthening Dry Shampoo contains B12 Vitamins and Keratin to help strengthen your hair. 2. Volumizing Dry Shampoo contains Mineral Clay and Citrus to freshen and leave your hair voluminous. 3. Smoothing Dry Shampoo contains Vitamin H and Silk-Proteins that leave your hair straight and silky smooth. 4. Moisturizing Waterless Foam Shampoo contains Witch Hazel, Citrus and Aloe Vera for ample moisture. - Shake properly before use and between spray bursts. - Do not spray continuously into your hair like you would with hair spray. - Instead spray in short bursts holding the shampoo 8-12 inches from your hair. - Remember to apply the spray to your roots as well. - Use your fingertips or a brush to apply it evenly throughout your hair. - Keep the shampoo in your hair for 1-2 minutes. Tip: If your TRESemme Dry Shampoo gets clogged, simply remove the nozzle, rinse it under warm water then re-attach. Take a look at this YouTube video tutorial from 'Forever Yours Beauty' that will guide you through the steps on how to use TRESemme Fresh Start Dry Shampoo to achieve maximum results. Plus you could be the lucky viewer to win a $500 Target gift card. Simply watch the video below for details on how to enter for your chance to win. 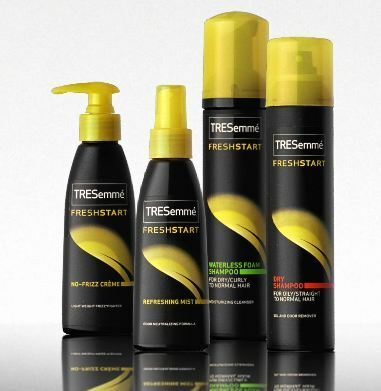 What do you think of TRESemme Fresh Start Dry Shampoo and will you try it? Leave a comment below. I've never tried a dry shampoo sounds like a good idea. its amazing i think i actually live for dry shampoo it means my hair is so much healthier where im not stripping all natural oils from my hair as often which is great! !